What is Rumor Psychology all about? 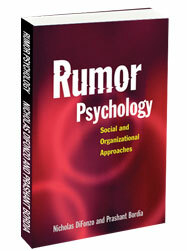 In Rumor Psychology: Social and Organizational Approaches, Nicholas DiFonzo and Prashant Bordia present a landmark scholarly review of rumor research, offer an integrated model of rumor phenomena, and set forth a detailed agenda for rumor research. Each day, we struggle to distinguish rumor from fact. Did the U.S. government blow up levees in New Orleans during Hurricane Katrina? Did American soldiers use night-vision goggles to spy on Iraqi women in Fallujah during the Iraqi War? These reports, taken from national and international media accounts, turned out to be false. Rumor is closely entwined with a host of social psychological and organizational phenomena, including social cognition, prejudice and stereotyping, interpersonal and intergroup relations, social influence, and organizational trust and communication. Exactly what is rumor, and how does it differ from gossip and urban legend? Why do people spread and believe rumors? What attitudes and actions do they affect? How do rumors become more—and less—accurate? How does trust affect rumor propagation? How may harmful rumors be prevented and neutralized? This book will be of special interest to social psychologists, organizational psychologists, and researchers in organizational communication, organizational behavior, and human resource administration. It will also appeal to public relations personnel and managers who regularly encounter rumors. In addition, it will be a valuable asset to persons seeking to understand conflict in political contexts.